Pastel colored homes linked to overflowing streets of devoted beachgoers, busy bicyclers, and a bustling town center depicts the heart of Seaside, FL. What began as one man's dream, has now become an architectural portrait of New Urbanism for the world. Established as a perfect beach utopia, this small town brims with excitement, drawing a surplus of tourism yearly with the quieter months being in the winter. You may also be familiar with Seaside from Jim Carrey's famous movie, The Truman Show, filmed here 1998. Just like Truman's House, homes in Seaside showcase charming white-picket fences, flaunting colorful exteriors with a summer cottage style. 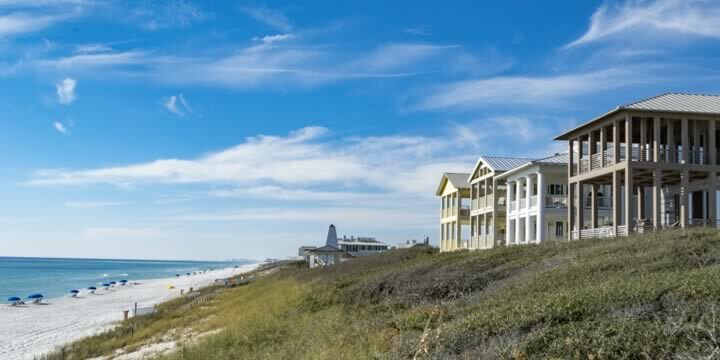 Homes in Seaside, FL are remarkable yet classic. What is so unique about Seaside is that as a community, it draws in high-end homeowners that appreciate the simplicity of a humble, coastal beach town. The styles of the homes in Seaside are renowned for their vibrant colors and quintessential beach cottage vibes that keep visitors returning year after year. Returning visitors also makes any home purchased here a tremendous financial investment for gaining rental income as homes book fast here during the vacation season. There are not separate neighborhoods within Seaside, but the streets create a barrier from the hustle and bustle of the town center. A house here can sell for anywhere from $1,400,000 to $6,500,000. They are strongly desired in the real estate market and can sell fast, as Seaside only has around 300 homes within its borders. Ruskin Place is one of the only areas in Seaside where your home's first floor can be used as a commercial property, making it a great investment for any entrepreneur. On Ruskin Street, you will find numerous boutiques, set alongside the open green and shadowed by overgrown oak trees. This street is different from the rest of Seaside, portraying an old-world European style architecture dotted with balconies, stone-lined streets, and quiet benches. If you are looking for an active community with an abundance of events steps from your home, then Seaside may be the perfect place for you. The center of town is set around an open grassy field boasting an outdoor stage. They showcase concerts, plays, and family movies in the green for all ages. There is also a year-round weekly farmer's market that is perfect for gathering fresh local produce. Seaside is home to 16 restaurants, with some of the most retro being the ones located in the vintage Airstream trailers at the entrance of Seaside. These five restaurants provide a gourmet food truck experience selling delicious vittles like BBQ, shaved ice, hot dogs, and raw juice. The fun does not stop with the food; the shops in Seaside speak for themselves. With 28 boutiques, art galleries, and specialty stores there is a little bit of something for everyone here. One of the most interactive is Fired-Up Pottery Painting where the whole family can paint pottery then get it "fired" in the kiln, and take it home as a memory. Seaside is the ideal community for children, with Seaside Neighborhood School, a top-rated charter school sitting directly within the town. 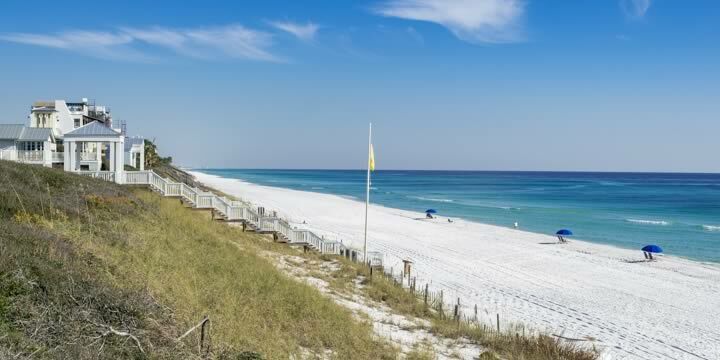 If you are interested in owning a forever home in Seaside, FL, call us at Emerald Coast Realty, and a trained realtor would love to assist you in becoming a Seaside homeowner.